Baby ear piercing is a controversial topic in the United States, though in some cultures it’s common practice. In Latin America and Spanish cultures for example, the baby’s ears are often pierced just days after birth as they believe it is less painful than waiting until the child is older. While the American Academy of Pediatrics states there’s minimum risk regardless of what age the ears are pierced, they do recommend waiting until the child is old enough to decide for themselves. 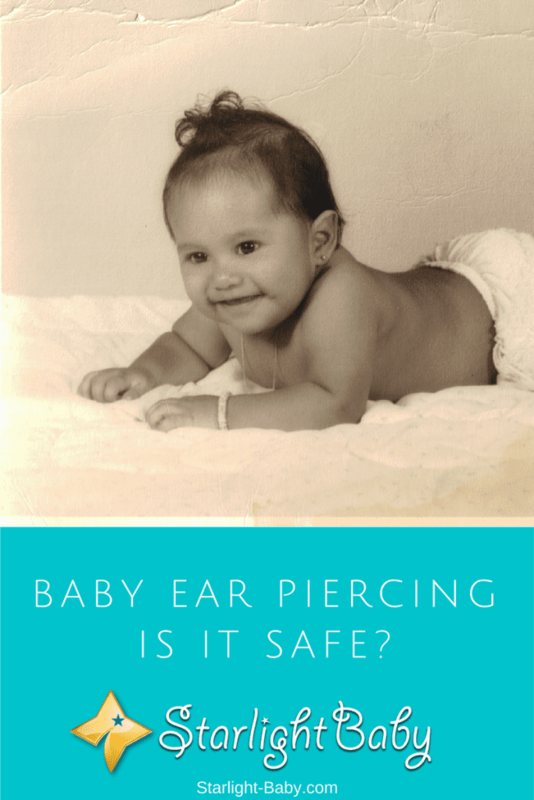 So, is it ever right to pierce your baby’s ears and is it safe? There are a lot of mothers and experts who believe baby ear piercing is a form of child cruelty. You don’t have to look far online to find people furious over mother’s who have chosen to have their child’s ears pierced. When Kim Kardashian uploaded a picture of daughter North sporting diamond studs on Instagram, her followers were outraged. Model Gisele Bundchen also faced the wrath of the public when she uploaded a picture of her seven-month-old daughter wearing gold earrings onto Twitter. Some are so outraged by baby ear piercing that they’ve called for it to be completely banned. But is it really a form of child cruelty? When baby’s ears are pierced, yes they will feel it, even though the area is numb. However, the experience doesn’t last long and within a minute or so at the most, they will forget all about it. In years to come they also won’t remember the experience. Therefore, there is an argument that piercing a child’s ears when they are a baby is a lot less traumatic than waiting until they are older. So why then, if there is an argument for getting it out of the way early and saving the child trauma in the future, does it spark such controversy? Well, the main factor is it is seen as benefitting the parent not the child. As a baby, your child obviously has no interest in how they look. They care about sleeping, eating and bonding with you and that’s about it. Therefore, mothers who do choose to have their baby’s ears pierced are accused of doing so in order to better their own image. It’s compared to using their baby as a fashion accessory. It is widely believed children should be able to make their own choices once they are old enough to do so. However, it does come down to personal opinion. As with any form of parenting, it is purely up to you to decide how you go about it. Just be aware not everybody will be understanding of your choices, particularly if you do go ahead and get baby’s ears pierced. How Safe Is It To Pierce Your Baby’s Ears? Provided the piercing is carried out correctly by an experienced, professional practitioner, the risks involved at very low. However, that doesn’t mean they don’t exist. The main risk involved with any type of piercing is infection. For this reason, while it is possible to get your little one’s ears pierced after just a few weeks, it is advised you wait until they are at least two-three months old. This is the time their immune system should be strong enough to handle an infection if it does develop. However, at this age the immune system would only be able to handle a very mild infection so this should be kept in mind when making your decision. The key, as mentioned earlier, is to ensure you are choosing a respected practitioner. That way, you have peace of mind that the needles are likely to be sterilized, posing less risk of infection. Not all ear-piercing stores have the right equipment to pierce a baby’s ears. It’s important to note that a piercing gun should never be used on babies as they pose a much higher risk of infection. When choosing which earrings your little one has, make sure they are at least 14 karat gold. This reduces the chance your baby will suffer an allergic reaction. Even the backings of the earrings should be gold. Experts recommend continuing to use gold earrings for the first year. Once the ears are pierced, you’ll also need to keep them clean without removing them. It’s very important to avoid removing the earrings for at least six weeks as the ears need chance to heal. You can however rotate them gently, as this will help to maintain the hole and ensure it doesn’t crust over which could become painful for baby when it comes time to remove them. Overall, there is a low risk involved if you decide to get your baby’s ears pierced. So, in terms of safety as long as you choose an experienced practitioner with the right equipment and you take proper care of the ears afterwards, it should be perfectly fine. However, the majority of parents do appear to be against piercing a baby’s ears. At the end of the day it does come down to personal opinions and beliefs. Nobody can tell you what is right or wrong as a parent, so always do what you feel is best and be sure to look at both sides of the argument before making a decision. Have you got an opinion on baby ear piercing? We’d love to hear it! In our culture, it is highly recommended to pierce baby’s ears, irrespective of gender. Some parents follow this cultural trend whereas some disobey it. The question is not whether piercing is safe or whether and it causes pain or not, the main question is it child cruelty or not. This is an important question because we give emphasis on personal freedom. If you are baptizing a child, do you care about his/her will, do you ask you child whether he wants to baptize of not. You are a christain and you will baptize your child, Muslims go through circumcision. These are cultural practices. Various cultures do have various practices, some of them we can’t really fathom why it’s done. But for someone who is a part of that culture or practice, it would be something normal. My husband and I took both our daughters to have their ears pierced at three months old. We have had no problems at all with them wearing earrings – unless you include some disapproving comments initially from some older relatives which we ignored. Now the girls are older, they both love the fact they can wear earrings while some of their friends at school cannot do so. As you have quite rightly written above, there is no right or wrong policy on this – it is purely a matter of personal choice but both my husband and I are pleased that we took both our little girls to have their ears pierced as infants.